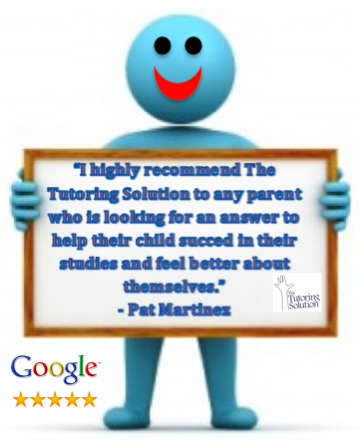 Pat Martinez Gives The Tutoring Solution 5 Stars! The Tutoring Solution has been just that.. a solution for my daughters challenges with her school work. I have been so pleased with not only the improvement in her grades while working with her tutors but also the personal attention and dedication by the owner of the company in making sure that they are doing all that they can to bring about positive results. Not only have my daughter’s grades improved in a couple of challenging subjects but her belief in herself and her abilities has increased with the knowledge of new techniques and encouraging words shared by her tutors. I think what my daughter also enjoys is the fact that her tutors really are passionate about the subjects they teach and their true commitment to giving her all the tools she needs to not only pass her classes but excel. I highly recommend The Tutoring Solution to any parent out in the inland empire area who is looking for an answer to help their child succeed in their studies and feel better about themselves. I promise you the money you spend will be well worth every penny. Pat Martinez’s daughter, Theresa Valdez, has been receiving tutoring with us since April 2013. We have been working with Theresa to help her gain a better understanding of Pre-Calculus and AP US History. We look forward to continue working with her in the fall of 2014. We provide tutoring in Norco, Ontario, Eastvale, Chino Hills, Chino, Mira Loma, Alta Loma, Corona, Rancho Cucamonga and all the surrounding cities. We have students from Sky Country Elementary, Oxford Prepatory Academy, Townsend Junior High School, Roosevelt High School, Alta Loma High School, Norco High School, Centennial High School, Chino Hills High School, Ontario Christian High School and Ayala High School. Tutoring Solution Student Gets the Silver Medal in Inland Empire Science & Engineering Fair – Congratulations to Theresa Valdez! Tony and Jennifer Baho Give The Tutoring Solution 5 Stars!